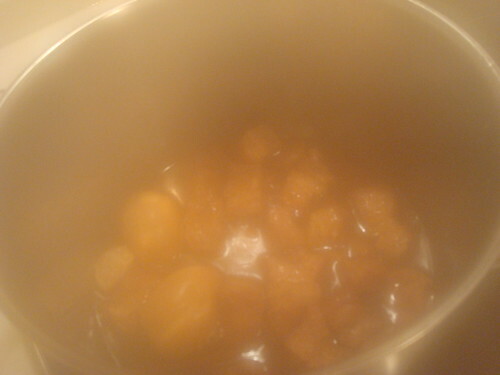 *my brother specially added that too much cinnamon makes the pork "siap siap" (tannic). 2. put the pork in fatty side down. 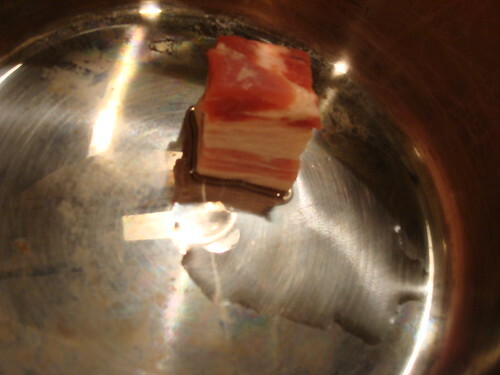 if the cut is not too fatty, you can add a bit of oil. the pork will char a little on the base. keep it standing upright. 3) when half of the fatty bit turn translucent (ie. cooked), throw in the garlic first. brown it. 4) then throw EVERYTHING else in. eye-ball the level of liquid (cooking wine & soy sauce, 50 - 50 is advisable). 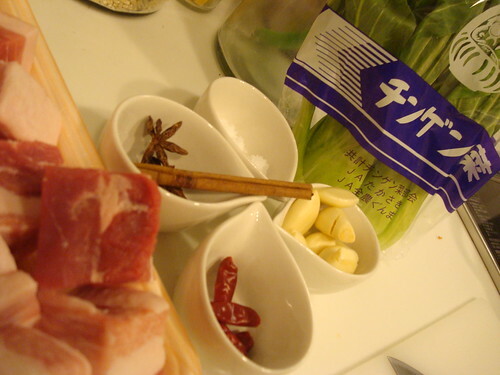 it should submerge half of the pork in sauce. bring it to boil then simmer for a very very long time with lid on. (depending on the settings on your stove. it might take anything from 1/2 hour to 4 hours!! just prod the meat to see if its soft yet. 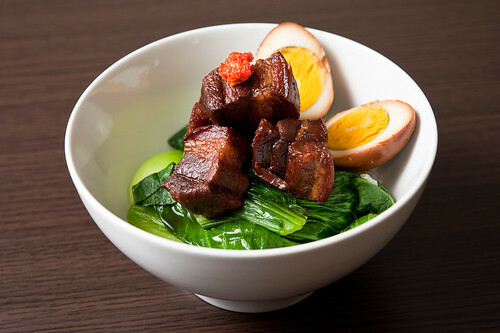 5) scoop freshly steamed rice, covered with greens and topped with delicious pork belly. topped with grandma's chilli! 6) bribe your husband to take awesome pictures so your kitchen adventures seem a little more professional. looks delish and definitely looks pro! And u chose to make ox tail stew for home ed?! Something so difficult?! Well done darling! It looks super yummy! he actually likes it when i involve him in the process! Did we have to make oxtail stew for home ed?? i don't know man! but i did and i burnt it in that dingy home-ed classroom with the many stoves. i remember bulldog (discipline mistress & also my home ed teacher) staring at me in disgust. I had Bulldog as my home ed teacher too, she made lessons which were supposed to be fun a nightmare. Was totally envious of the other half of the class who had the sweet and gentle Mrs Lee for home ed. She really did scar my memory!! I remember learning about the sewing machine n even though I'm crazy about sewing now, I hated it back then!! *sigh* hope my students don't think that of me too!!! Hahaha.. well done princess zhing. they look yummilicious! haha. those are my grandma's suggestions!! but i've read a few other recipes!! good luck! :) this time, you share your kitchen escapades with me ok? Awww thanks babe!! I'm just trying my best!! i guess a great sense of satisfaction comes from cooking something we enjoy so much and perceive it as something very difficult to cook and yet one day when we decide to try to cook it, follow the instructions very carefully and tah dah! we made it! now we can have lots of the good thing, isn't it? that's why i went to learn the tiramisu, seafood paella and apple tarts! 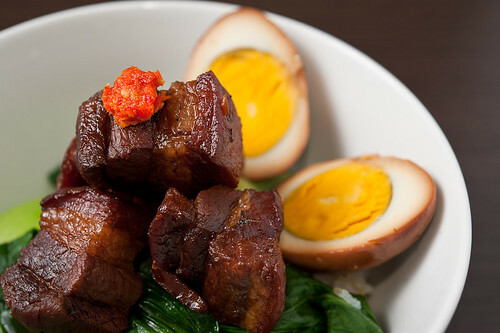 dan chao fan! :) i love also!!! i just got lazier and lazier when i got to japan!